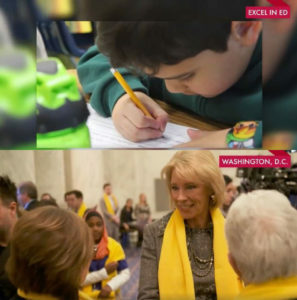 I have a question for all elected officials, on both sides of the political aisle- Are you for Jeb Bush’s ExcelinEd yellow scarves School Choice Week? 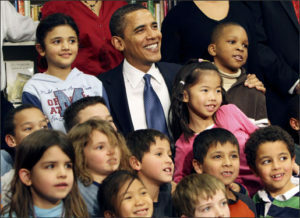 Which, by the way, is the same thing Obama was pushing, he just called it National Charter School Week. The end game is the same. 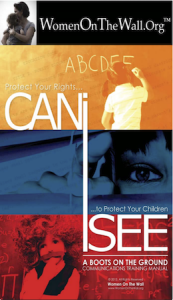 A loss of parental rights and true local control. Along with the collection of private student data that will be used for online adaptive assessments and instruction to modify the attitudes, values, beliefs, and behaviors of American students by third-party public/private partnerships, who will then profit from the unethically and illegally obtained student data. 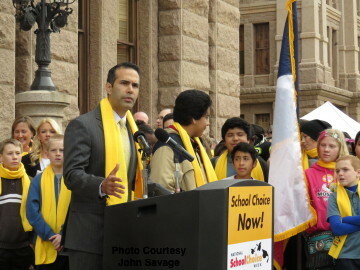 In Texas, I have heard those pushing so-called “School Choice” say they are for ALL school choice options. They will say whatever they are pushing is just one more tool in the toolbox for parents to choose. This is a ridiculous statement. Not all school choice is the same. In fact, government regulated school choice limits parental rights, it does not expand it. Jeb Bush’s ExcelinEd is at it again this year with the National School Choice Week, pushing #FakeSchoolChoice right along with Secretary of Education Betsy Devos. Once again we are asking… Who is paying for all those yellow scarves? Yep, those who will profit off the backs of our children and their teachers. It is extremely important to point out the difference between Good “School Choice”, which we already have and Bad “School Choice”. Jeb Bush’s School Choice is Bad because of the College and Career Ready aligned Common Core National Standards. Anyone for a blanket “School Choice” needs to understand what that actually means and just how dangerous it is. Jeb Bush/Betsy Devos Choice is the Carrot to federal control. What is happening in Houston ISD is Bad School Choice. And a major national security issue because of the Gulen Harmony School. Those pushing school choice using ALL “Education Sectors” – Please be careful. Education Reformers on both sides of the political aisle are going full force. Texas is the heart of the reform movement. They have destroyed our education system intentionally, so they can rebuild it using Public/Private Partnerships financed through Social Impact Bonds (SIBS) or Pay for Success (PFS). They will profit off the backs of our children and their teachers. All while harming countless numbers of our children in the process. The question is, who is willing to step up and protect Texas students and their teachers? • everything listed here is aligned to government data collection compliance. “That critique focuses on a runaway bureaucracy’s threat to constitutional government. Congress has improperly delegated much of its law-making power to bureaucrats, who in turn have abusively expanded this authority. The courts, for their part, have turned a blind eye to the administrative power-grab. Meanwhile, agencies staffed by unelected bureaucrats now operate de facto courts. In effect, these agencies negate the separation of powers by simultaneously exercising legislative, executive, and judicial functions, the very definition of authoritarian rule. On top of that, administrative adjudication commonly evades constitutionally protected due process rights. There is a fundamental “SHIFT” occurring in education today. Some will say it is 21st Century Learning. The truth is, technology is the only 21st Century thing about it. These are the same battles that were fought in the past; beginning in the 1930s and more recently, in the late 60’s and early 70’s and again in the late 80′s and early 90′s. It is what was coined back then- Outcome Based/School to Work education. Purposes Behind Common Core/College and Career Ready National Standards now codified into law through the passage of the Workforce Innovation and Opportunity Act (WIOA) and the Every Student Succeed Act (ESSA). Shifts Education Philosophy– An education of Opportunity (Equal Opportunity) based on academics; reading, writing, math, and history has shifted to an education of equity (Equal Outcomes) based on attitudes, values, beliefs, and behaviors. Broadened Impact – The Common Core/College and Career Ready National Standards expand the target be from K-12 (Kindergarten through 12th grade) to a P-20 (Pre-school through College, Trade or Graduate School) Workforce system. Testing Based Outcomes– The Common Core/College and Career Ready National Standards shifts from the “Mental” (Academics and Knowledge-Based Tests) to “Behaviors” (Performance Standards and Competency for the workforce). Adjustments to Ideology– Change American’s worldview from nationalism into globalism and allow a government controlled economy known as ”Dirigisme” or the more common use–a dirigiste economy. It means essentially a state-directed economy mandated by federal and state legislation. Dismantle traditional public schools in favor of charter-like structures (public/private partnerships) that will be forced to generate student data for corporate profit and state control. Through School Choice access and control private schools where the state has been unsuccessful before. (In Texas homeschools are considered private schools). A FEDERAL UNCONSTITUTIONAL SYSTEM has been locked in place through the passage of federal and state legislation (designed like a set of gears) “rigged” if you will, to sort our children into positions within the workforce, based on the Soviet model. This is about controlling the next generation of Americans. You are no longer an American who lives in a global economy, you are a global citizen who happens to live in America.